and committees and nothing to Democrats, federal records show. donated $25,000 to the DeLay Foundation for Kids, a charity the lawmaker founded. In 2002 Alone, President Bush Jr. accepted $14,254 in gifts. and a puzzle worth $1,707. VICE President (and I mean vice) Cheney accepted $17125 in gifts. to rub elbows with the president. or their spouses became ambassadors, mostly to Europe. finance chairman of the Republican National Committee, went to Paris. Lobbyist Peter Terpeluk went to Luxembourg. job done, and someone who has the best qualifications," Healy said. In the first Bush administration, pioneers' spouses also got into the action. assembled his first administration and set policy priorities. named to the President's Committee of Advisers on Science and Technology. former President George H.W. Bush and Barbara Bush, on the U.S.
that could force serious increases in phone bills all over the country. appeal". The decision could affect 50 million customers nationwide. New York Times, 6/10/04, www.nytimes.com/2004/06/10/business/10PHON.html. 6. U.S. Department of Justice, www.usdoj.gov/osg/aboutosg/t_olson_bio.htm. 7. Gibson, Dunn, and Crutcher, www.gdclaw.com/practices/detail/id/632. Oval Office desk to `The buck stops here' on the Lincoln Bedroom. And that's not good for the country." Tom and Andi Bernstein: Tom Bernstein was a Yale classmate of Bush. the Texas Rangers baseball team. when Bush was Texas governor. Brad Freeman: Bush fundraiser and California venture capitalist. Texas and former Texas House speaker. Adair Margo, Bush fundraiser and longtime friend of Laura Bush. $100,000 for each of Bush's presidential campaigns. at least $200,000 for Bush's 2004 campaign. and his wife, a Bush cousin. and was a partner with Bush in the Texas Rangers baseball team. private quarters in the Texas governor's mansion and White House. secretary of state and insurance commissioner by then-Gov. included the Texas Medical Association and State Farm Insurance. Cliff and Michele Bomer: Elton Bomer's son and his wife. campaign in 2000 and was named ambassador to Hungary. 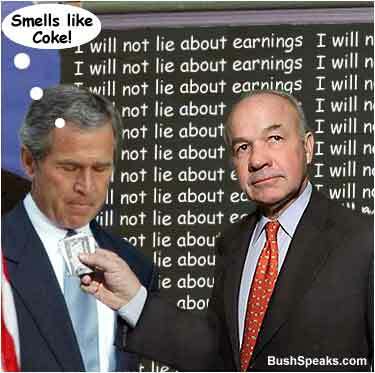 Mike Chennault is a Bush donor. Ben and Julie Crenshaw :  Bush donors. Joe and Sherryll Crutcher: Bush donors. Donald Etra and family : Donor to his 2000 campaign. was a Bush appointee when Bush was Texas governor. William and Regan Gammon:  Bush donor. Dealy Herndon and his wife: Mrs. Herndon is a Bush donor. Janet Heyne : Bush donor. Dee and Adair Margo : Bush donors. is a childhood friend of Bush who introduced him to Laura Bush. Colorado Gov. Bill Owens and wife, Frances: Owens is a Bush "ranger,"
raising at least $200,000 for the 2004 campaign. New York Gov. George Pataki and family : Gov. Pataki is a Bush ranger. U.S. Ambassador to China Clark "Sandy" Randt Jr. and wife, Sarah. with Bush in the Texas Rangers. Rusty and Deedie Rose: Rusty Rose was a Bush partner in the Texas Rangers. accepting gifts from political appointees and a state contractor. He is also the subject of a federal corruption investigation. Scott and Julie Sayers : Bush donor. Billie and Carolyn Schick: Bush donor. James and Betsy Sowell: Bush donors. Charles and Frances Younger: Bush donors. Josh Bolten : director, White House Office of Management and Budget. Faisal El Fayez: Minister of the Royal Hashemite Court. Bank of the United States and a Bush donor. Tom Kelly: Spokesman for British government. Gen. Sa'ad Khair: Jordan's director of general intelligence. White House staffer Clay Johnson. team advising him on energy policy. Sir David Manning: Foreign policy adviser with British government. Mark and Annie McKinnon: Mark McKinnon is producing Bush's campaign ads. Harriet Miers : deputy White House chief of staff for policy. Baroness Sally Morgan: director of government relations, British government. Boots and Susan Nowlin and family: Bush donors. Jonathan Powell : Chief of staff to British prime minister. Sergey Prikhodko: Head of foreign policy for Russian government. Vladimir Rushailo: Secretary of Russian security council. Yuri Ushakov: Russia's ambassador to the United States. "Some dishonest individuals have failed our system. and reform, driven by a new ethic of responsibility." Together donated $2 million to George W. Bush. contribute $500 and senior executives at least $5,000. It gave more money last cycle than any other energy company. in order to drive up prices that year. a new national energy policy in secret. Governor , including the infamous "grandfathered plants" deal. pursuing international projects in developing countries." support to U.S. companies abroad. It's called corporate welfare. for which Bush lobbied actively, and, of course, in "tort reform,"
making it harder to sue corporations for the damage they do. Back To Howie's Stupid GOP Quote Page.